The best meat at affordable prices! 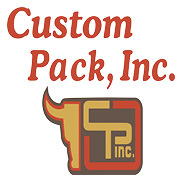 Custom Pack butcher shop only sells the finest quality meats in the area, guaranteed to be cut fresh daily, with no prepackaging. When you are ready to cook, we have what you need! We have it all… beef, pork, chicken, seafood, cheese, condiments, and even frozen desserts! Our products are priced for true value when compared to the chains & also available in large quantities for events as well. Having decades of experience under our belt, we take this work seriously. Whether its beef top sirloin, pork back ribs, or jalapeno cheddar brats, we have what you need. Call ahead of time to see what we currently offer, so you can be in and out quickly when you arrive. If needed, we also provide large quantities for your next event.